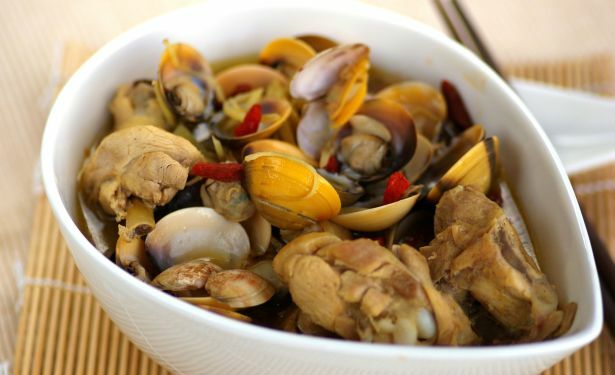 Rinse clams thoroughly and soak in clean water for 10-15 minutes. Wash and rinse again. Heat sesame oil and fry ginger until fragrant. Add chicken and fry for a while. Dish out onto a heatproof dish. Steam for 20 minutes or until chicken is just tender. Bring water to a boil. Transfer the steamed chicken to the boiling water. Add kei chi, clams and seasoning. Cook for 2-3 minutes or until the clams open up. Once the soup comes to a boil add the wine.